These systems use devices that respond to the smoke particles produced by a fire. They operate on the ionization, photoelectric, cloud chamber, or other smoke particle analysis principle of operation. Spot-type smoke detectors use either the ionization principle of operation or the photoelectric principle. These systems are intended for early warning. Some are designed for installation in ventilation ducts. (See NFPA 72, National Fire Alarm Code.) Properly installed, smoke detectors can detect smoke particles in very early stages of fire in the areas where they are located. The selection of a particular detector or mixture of detectors should be made by a fire protection specialist and based on building and fire-load conditions. Ionization Smoke Detection. The principle of using a small amount of radioactive material to ionize the air between two differentially charged electrodes to sense the presence of smoke particles. Smoke particles entering the ionization volume decrease the conductance of the air by reducing ion mobility. The reduced conductance signal is processed and used to convey an alarm condition when it meets preset criteria. Ionization smoke detection is more responsive to invisible particles (smaller than 1 micron in size) produced by most flaming fires. It is somewhat less responsive to the larger particles typical of most smoldering fires. Smoke detectors that use the ionization principle are usually of the spot type. Photoelectric Light-Scattering Smoke Detection. The principle of using a light source and a photosensitive sensor arranged so that the rays from the light source do not normally fall onto the photosensitive sensor. When smoke particles enter the light path, some of the light is scattered by reflection and refraction onto the sensor. The light signal is processed and used to convey an alarm condition when it meets preset criteria. Photoelectric light-scattering smoke detection is more responsive to the visible particles (larger than 1 micron in size) produced by most smoldering fires. It is somewhat less responsive to the smaller particles typical of most flaming fires. It is also less responsive to black smoke than to lighter colored smoke. 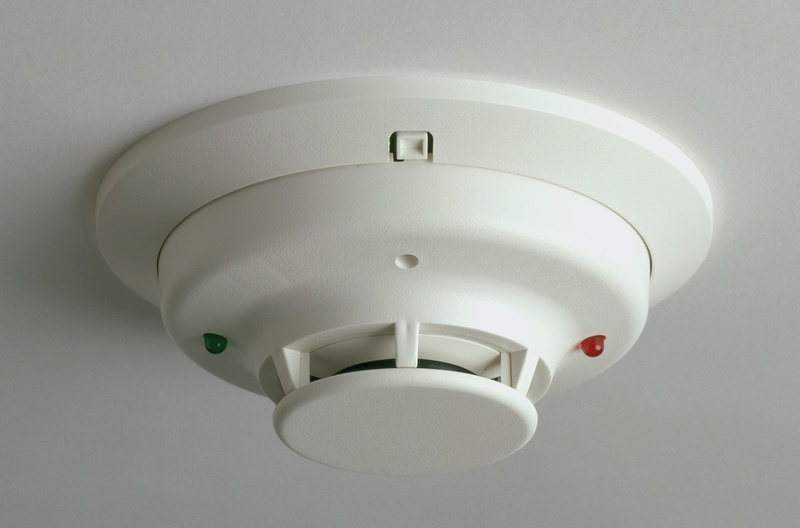 Smoke detectors that use the light-scattering principle are usually of the spot type.